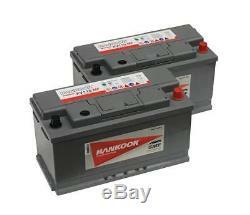 2x Hankook 110Ah Leisure Battery XV110MF. 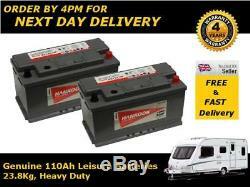 This leisure battery is ideal for caravans that have a motormover fitted. 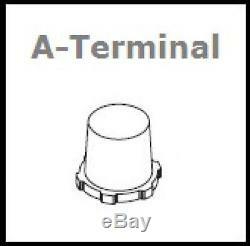 Terminal Type -Standard Post (A). Total Height (mm) - 190. Weight (Kg) - 22.7. Caravans, Boats, RV, Leisure use and more. This is a Heavy Duty Domestic battery and it's purpose is to run applications with it's deep cycling capabilities. This range of Leisure / Marine batteries are of a lead calcium construction which means the plates have been hardened, therefore giving the battery a longer life and better starting capabilities than your conventional leisure batteries. This battery comes fully charged and ready for use. It is a DEEP CYCLE battery, which means unlike a car battery, they can handle being discharged to a higher capacity and recharged again without affecting the future performance of the battery. Another thing to note about these batteries which is vital is that when charging and discharging they have 250 life cycles. Excellent design handle - Easy battery replacement. Integrated computer designed and reinforced container - Protection from vibrations and impact. Special sealed covers - Prevents acid leaks and minimizes gassing. Totally sealed and spill proof. Maintenance Free - no topping up required. If you are unsure in any way, please do not hesitate to contact our sales team. Please note that we are unable to deliver to the following postcodes. AB31 - AB38, AB40 - AB56, KW1 - KW17, PA20 - PA80, PH4 - PH50, IV, HS, JE, IM, BT, Channel Islands & Ireland. Sign up for our newsletter to receive exclusive offers and discounts. Plus be the first to hear about the latest fantastic products and news at Battery Megastore. The item "2x Hankook 110Ah Deep Cycle Leisure Battery 12V Has Charge Indicator" is in sale since Tuesday, February 2, 2016. This item is in the category "Vehicle Parts & Accessories\Motorhome Parts & Accessories\Caravan Parts\Mobile/ Touring Caravan Parts". The seller is "batterymegauk" and is located in GL20 8NB. This item can be shipped to European Union member countries.